What many of the tourists don’t realize is that the majority of the electricity powering their needs comes from renewable energy. Yet for the residents of Bonaire, the switch from fossil-fueled to renewable energy systems has made a world of difference. The result is a transformed electricity system on Bonaire. The island is now home to 12 wind turbines with a total of 11 MW of wind power capacity, which contribute up to 90 percent of the island’s electricity at times of peak wind, and 40-45 percent of its annual electricity on average. The Bonaire system also includes 14 MW of diesel generation, five total generators, which provide the necessary power to meet the load when there is not enough wind power available. The generators are equipped to run on both traditional diesel as well as biodiesel. The next steps in the island’s energy transformation involve using local algae resources, grown in the large salt flats on the island, to create biofuel, which can then be used in the existing generators. 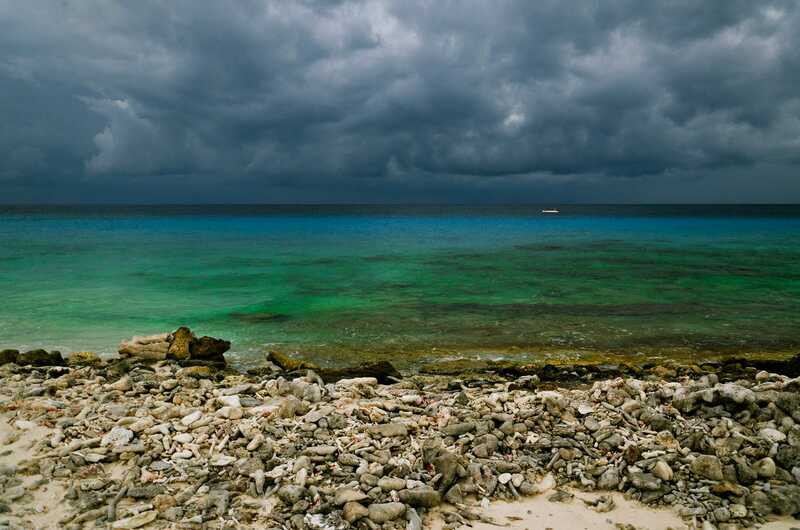 This will allow Bonaire to operate a 100 percent renewable electricity system—with on average 40–45 percent from wind and 55-60 percent from biodiesel. Two aspects unique to Bonaire’s situation may have contributed to the decision to switch to a 100 percent renewable electricity system. One driver may have been Bonaire’s status as a special municipality within the Kingdom of the Netherlands. This provides a connection with the Netherlands and Europe in general, where many countries have incorporated large amounts of wind and other renewable sources of electricity. Nearby Aruba, also a Dutch Caribbean island, has a wind farm as well, which provides up to 20 percent of the island’s electricity. There may be a common theme of islands with ties to European countries moving to renewables more quickly than others. In the case of Bonaire, the consortium that is developing the project, Ecopower Bonaire BV, is made up of Dutch and German companies. Secondly, Bonaire’s government and local electricity provider were presented with an opportunity to build a new renewable electricity system since they needed to replace the plant that was damaged. Many other Caribbean islands still have existing diesel resources that are not at the end of their lifetime. These existing generators may remain a part of the electricity system, especially as renewables are incrementally added to the system, and may even remain as backup power for a transformed system that operates mostly with renewables. However, if some or all of the existing diesel resources on an island are completely shut down before the end of their available lifetime, that island will need to consider the sunk costs involved and incorporate that into their overall energy transformation plan. Rocky Mountain Institute and Carbon War Room‘s ongoing Ten Island Challenge works with Caribbean islands to utilize their local renewable resource potential to transform electricity systems and provide a renewable, reliable, secure and affordable energy supply for their citizens. One of the participating islands is Aruba, which neighbors Bonaire and forms part of the ABC islands in the Netherlands Antilles, along with Curacao. Although the shift to renewables on Bonaire is not part of the Ten Island Challenge, Rocky Mountain Institute and Carbon War Room’s ongoing work in the area will strive to spread the success that Bonaire has achieved to the rest of the region, so that more Caribbean islands can take advantage of efficient and renewable electricity systems.